OWL is the UK’s premium brand of wireless energy monitoring and control products. The OWL team combines many years of commercial experience with an in depth knowledge of wireless hardware and cloud software development. Since their inception in 2006 they have designed and manufactured a broad range of high quality products which have become household favourites. Specifically designed to remotely control heating systems which incorporate a Heat Pump. 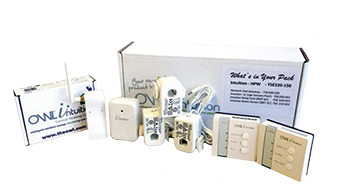 OWL Intuition HPW remotely controls the heating system from any internet connected device from anywhere and anytime. How does it work? Network OWL Gateway simply plugs into the home’s broadband router. This provides a secure connection to the OWL Intelligent Cloud software platform. The Network OWL Gateway automatically sends energy consumption and generation data to the cloud from the OWL Sensors and Transmitter. This can then be viewed via a clear, easy-to-use web dashboard showing live and historic data from any Internet connected computer or device and from anywhere. Compare the Heat Pump energy consumption with overall energy consumption in your property.